BioGaia’s business strategy is the starting point for sustainability work which is integrated into day-to-day operations. The materiality analysis and ongoing dialog with the company’s stakeholders provide support when prioritizing issues and resources. Each unit has operational responsibility for ensuring that targets and activities linked to the sustainability focus areas are integrated into operations. Planning of activities, governance and follow-up are incorporated into the business plans. BioGaia’s Communications and Sustainability Manager together with the CFO is responsible for coordination and communication of sustainability initiatives. Contributing to improved global health, through clinically-proven, health-promoting and user-friendly products, is BioGaia’s core business. Conducting this in a socially, environmentally and economically responsible manner is the basis for sustainability initiatives. 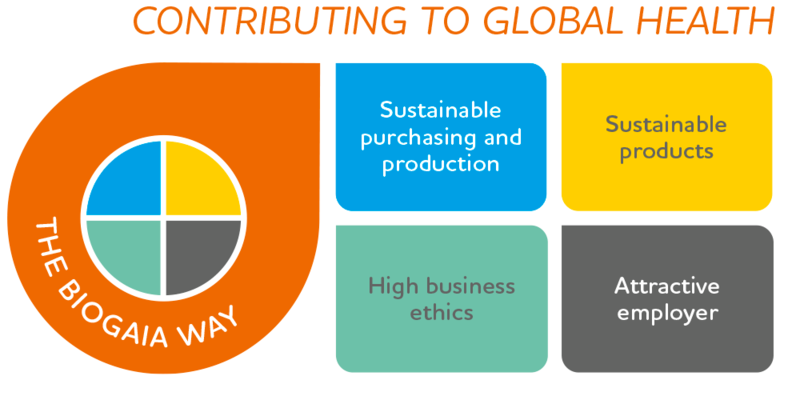 BioGaia’s ambition is to accept responsibility and take into account sustainability risks throughout the value chain – from supplier, via distributor, to consumer. To ensure that resources are directed to areas where they will do the most good, BioGaia has worked to build a platform for long-term sustainability initiatives. The core of BioGaia’s business is clinicallytested and user-friendly probiotic products. This is also the company’s main contribution to sustainable development in a wider perspective. The BioGaia Quality Standard is the name of a list of demands that BioGaia makes to maintain high quality and safety related to the products. The ongoing dialog with suppliers covers sustainability aspects such as quality, safety and environmental impact.